We saw this movie with our children and grandchildren. We all loved it! Excellent story, acting and special effects! Only action and nothing valuable from this movie. I wasted my time and money. This actor is already getting boring. Love the action and the comedic dialogue. It was very comical, entertaing, action packed. Strongly recommended to go see with the family. Very entertaining, comical, and at times very emotionally touching. Suspension of disbelief? Hey tips it's a super hero movie, it's bit real. Thanos isn't real. Fun but a weak plot and just an average Marvel film. I was expecting more based on the hype and the previews. The story requires a lot of suspension of disbelief beyond the idea of ability to shrink to insect size and magically control the ant kingdom. The movie does move at a quick pace but it seemed like none of the characters got any kind of development beyond the very superficial needed to move story along, felt like they were introducing a lot of new characters for future movies. Good movie for kids, as I don’t recall too much bad language and it does get a bit silly at times without devolving into inappropriate humor. I liked this movie, except for the gay FBI agent. Humor in an FBI agent is uncharacteristic. There was an equal balance of male/female strengths weaknesses. CGI again stole the show as it does in recent movies. Good movie on the whole. Cute......but kind of a simple plot, lots of action, liked the special effects. But you could wait for Net-flix or DVD, at price of movie. No need to rush out and see it. Fairly new movie, and there was only a handful of people in theater. Awful, truly awful... BUT would be a great birthday party matinee for a group of 11 to 13 year olds. Can a person make up their own mind about seeing a movie of their choice. This is the reason for having a brain. If the movie turns out to be a disaster go home and figure how to make your own. Great second movie. Liked this one and the original. Action and humor. 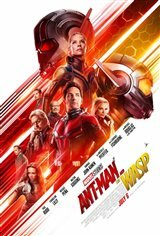 a light-hearted marvel flick with good laughs and an entertaining story. Paul Rod brings his A game in this one. lt was a great popcorn flick and awesome. A fun film, slightly better than the first. Paul Rudd not the typical super hero, but OK! ONE of the very few film for which most of the audience did not escape the final credits - which is the norm. The final scene [?] was a bit confusing, but maybe that wasn't the final, final scene??? Since I did leave before the lights came up.